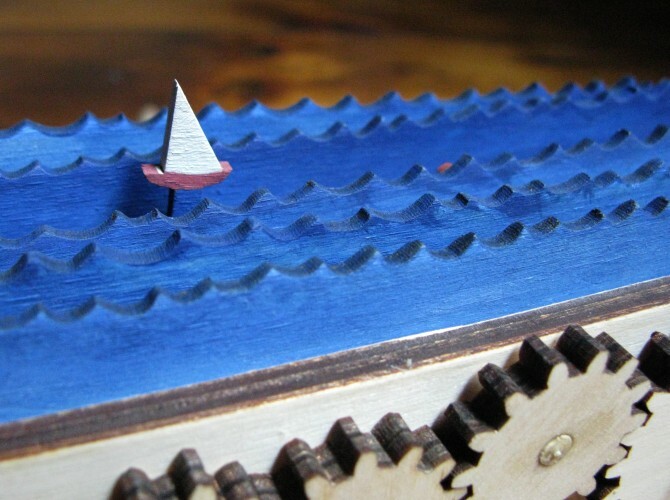 Being inspired by these AMAZING DESIGNS by Wanda Sowry, I decided to design my own automaton with a sailing theme. My first version was a failure. It was overly complicated and had too many gears. So I wrote it off as a learning experience and started afresh. After a few rough sketches of what I wanted, I used Solidworks to create the design and model each part. I could then define how the parts moved and interacted with each other, to refine the design and make sure it would work. It was then a matter of exporting each piece to Corel Draw so they could be cut on the laser cutter at my local Techshop. The fun part is painting, assembling and gluing all the pieces together. I made plenty of notes too on how the design could be improved and what tolerances work best. With everything assembled and working, I just need to show it off! This entry was posted in Automata, General and tagged automata, automaton, giant squid, kraken, laser cutter, make, sailing, woodwork. Bookmark the permalink.